Editor's note: this article was first published in the most recent edition of the Norwood News, which is out on streets and online now. Like many longtime smokers, Jarrel Jackson wants to quit smoking. Fortunately for his sake, so does Montefiore Medical Center, his employer and the largest employer in the Bronx, which recently expanded its No Smoking zones and is now offering smoking cessation resources for its employees. The new policy, Montefiore officials say, is part of a larger, comprehensive healthy living strategy, one that would affect a population even greater than the medical center’s nearly 18,000 employees. At a press conference last month (see video below) on national Kick Butts Day, March 23, Safyer said he could remember a time when doctors and other employees not only smoked outside of the buildings, but in the buildings. Untitled from Alex Kratz on Vimeo. 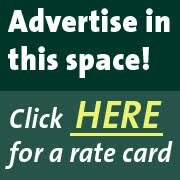 The institution, which Safyer called the “biggest economic engine in the borough,” has come a long way since then. Smoking is now considered almost synonymous with heart disease and lung cancer, two of the country’s biggest killers, and the hospital has taken steps to limit patient, employee and visitor exposure to it. For the past decade, smoking was prohibited within 25 feet of building entrances. Now, according to the new policy, smoking will not be permitted in any area around Montefiore locations, including common areas in residential buildings, parking garages and community sites. 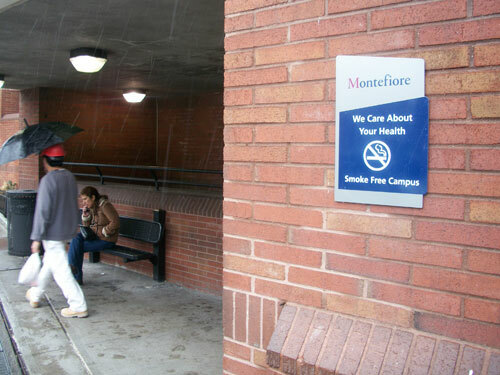 The shelters set up around Montefiore campuses, once a bastion for smokers, have now been removed. For employees like Jackson who want to quit, the medical center will be providing smoking cessation literature and resources, including smoking alternatives like the nicotine patches and gum. Safyer didn’t get into specifics about how the policy would be enforced. Instead, he focused on how the medical center would be “changing the culture” of smoking on its campuses and promoting an environment where smoking is discouraged. According to Bronx Breathes, a nonprofit organization that trains physicians on smoking cessation strategies and how to assess tobacco use, 18 percent of Bronx residents smoke. Several Montefiore employees approached the table on Kick Butts Day, which was also staffed by representatives from American Cancer Society and the NYC Coalition for a Smoke-Free City, the group that successfully lobbied for a smoking ban at city parks and beaches, a policy that will be implemented in May. Jackson, who works in the hospital’s oncology department and moonlights as a rapper (moniker: Cap’n J. Crunk), stopped at the table. He said he wanted badly to stop smoking for himself, but also for the sake of his 19-month-old son. Br News Network - the last comment is very clearly a "commercial advertisement." Don't you see that? By your own rules, aren't you supposed to delete these? Or do you want Bronx youth to start "smoking" e-cigarettes?